Charles Leclerc feels "lucky" after seeing the damage to his Sauber Formula 1 car's halo caused by an airborne Fernando Alonso in the Belgian Grand Prix first-corner crash. 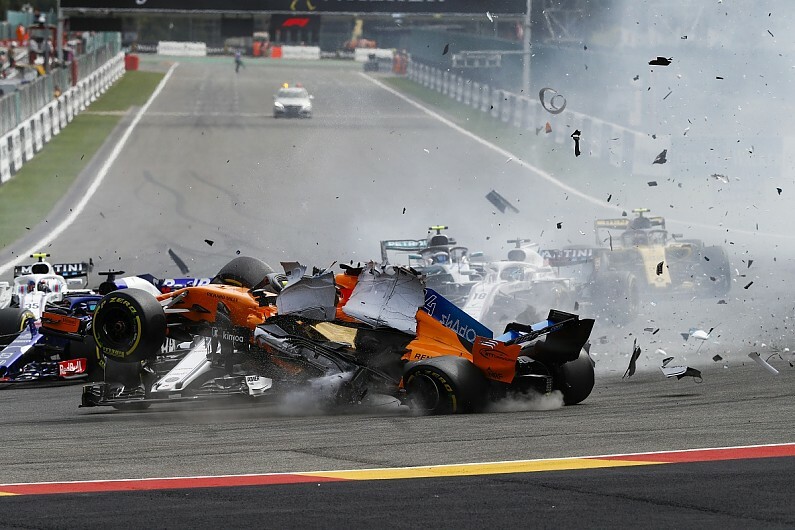 Alonso was rear-ended by Nico Hulkenberg under braking for La Source, which sent the McLaren up and over Leclerc's car and it made contact with Leclerc's halo device in the process. The halo was introduced this season, to mixed opinion, to improve driver safety. Leclerc said: "I don't know how it would have ended up without but looking at it, I'm happy it was there. "I've been lucky on this one. Looking at the halo, it's not looking good." The rookie was completely unhurt in the crash, and said that the images are "quite spectacular but it was not that big in the car". Leclerc explained that the incident happened so quickly he did not realise what was happening at the time. The rookie initially thought Alonso had made a mistake under braking but has since watched the incident back and knows it was triggered by a Hulkenberg lock-up. Hulkenberg has been given a 10-place grid penalty for the Italian GP, with the stewards noting the similarity to the 2012 Belgian GP crash that led to Romain Grosjean being banned for a race. Leclerc said he was "not angry" with Hulkenberg and did not believe it merited a ban. "Nico is not a driver that has a past and you can see it's not deliberate what he did," said Leclerc. "I don't think [a ban is right] for this type of mistake. "If something is deliberate and dangerous than a ban should occur but not in this situation."